Ever notice how when you learn a new word, you start seeing it pop up everywhere? I've been told the phenomenon occurs because the human brain is wired to take note of familiar things while pushing the unfamiliar into the background in an effort to maintain focus. Without this instinct, we would go through our days in a constant state of distraction, eternally overwhelmed and derailed by sights and sounds that make no sense to us. Now, the same thing happens with facial recognition... and with objects, too, as I recently learned. Driving home from the Delaware shore a few months ago, I saw a man in a nearby car smoking an electronic cigarette. Yes, I've seen these objects before, but I never really took the time to let the image sink in. Well, for whatever reason — perhaps out of boredom — this electronic cigarette finally burned itself into my long-term memory. Since that drive, carrying with me my newly acquired mental familiarity with this not-so-new take on a centuries-old vice, I've been seeing e-cigarettes everywhere. I see people puffing on them while seated at outdoor restaurants, strolling the sidewalks downtown, driving in their cars, and even sitting in the stands at high school baseball games. They're everywhere, it seems... and without the stigma that a smoldering traditional cigarette would inspire. E-cigarettes are primarily nicotine-delivery devices that work by heating a nicotine-infused liquid into a vapor, which is then inhaled. Since no plant material is actually burned in the process, there is no 'smoke' nor any of the carcinogenic agents and carbon monoxide that come with it. 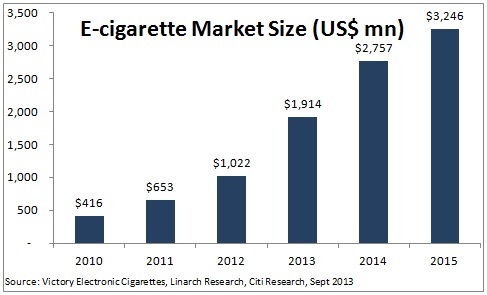 The market for e-cigarettes in the U.S. has been growing consistently over the past few years. It is estimated to have quadrupled in size from around $600 million in 2011 to more than $2.5 billion projected for 2014. Some of the key factors driving strong growth include increased awareness and trials, largely unrestricted marketing, and a growing retail distribution. The Altria Group, Inc. (NYSE: MO) (previously named Philip Morris Companies, Inc.) — an $82 billion giant and one of the largest tobacco companies in the world — estimates that 90% of adult smokers in the U.S. are now aware of e-cigarettes and around two-thirds have sampled them. 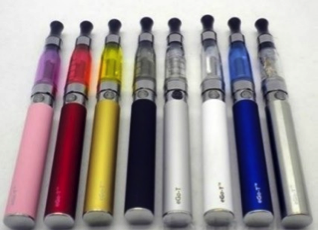 Coupled with declining traditional cigarette sales, the rise of the e-cigarette was a compelling enough argument to cause the multinational tobacco powerhouse to enter the e-cigarette market with its MarkTen line. However, it was a relatively late entry into this emerging market, with competitor Lorillard (NYSE: LO) — also a major player with a $21 billion market cap — controlling a full 50% of the North American market. That means two things: first, that Altria will be playing catch-up, and second, that large chunks of the remaining 50% are still in the hands of relatively small players. 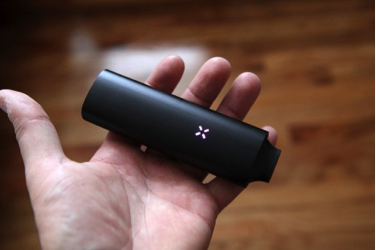 Smaller, privately held companies like Ploom, which builds the now-famous and pricey Pax (pictured below), control a good slice of the remaining pie with narrowly focused products for a very specific kind of consumer. There are many of these companies, each building handheld vaporizers and e-cigarettes capable of extracting vapor from plant matter and oils to be used with a variety of flavored tobaccos, as well as some less-than-legal substances. The main issue from an investment standpoint is that for the major players like Lorillard and Altria, e-cigarettes are just a small piece of the revenue puzzle, with traditional tobacco — a declining market — still accounting for a vast majority of earnings. There is only one public company out there at the moment whose main revenue stream comes from e-cigarettes, and that company is called Vapor Corp. (NASDAQ: VPCO). At just $92.5 million total market cap, this stock trades for $5.62 (down from a yearly high of $10.00 but still up more than 100% from its yearly low of $2.75). The Florida-based company designs, markets, and distributes electronic cigarettes, vaporizers, e-liquids, and accessories primarily in the United States and Canada. Among the small, pure-vapor e-cigarette companies out there, Vapor Corp. has the third-largest retail presence behind Blu and NJOY. Its products are in over 60,000 retail outlets in the United States... And yes, its vaporizers are compatible with marijuana — creating additional market potential as state laws regulating the drug are loosened. Adding some certainty to risk-averse investors, the stock made its Nasdaq debut less than two weeks ago on May 30th. So far, this tiny player has been showing telltale signs of arriving early to the ground floor of a rapidly expanding industry. For 2013, third quarter net sales exceeded $6.4 million, an increase of $2.6 million or 66.3% from the comparable quarter the previous year. Cost of goods sold increased 56% to nearly $4 million as compared to $2.5 million for same quarter in 2012. This progress can be primarily attributed to increased sales volume, product mix, and lower average cost per unit achieved through larger volume purchases. In that same time frame, gross margins increased from 35.1 to 38.9%, and operating income was $393,282 compared to an operating loss of $1,252,086 the year before. This led to net income of $280,827 for the third quarter of 2013 compared to a net loss of $819,010 a year earlier. A similar pattern is already starting to unfold this year, as the total market for electronic cigarettes looks to double for the second time in a row. Sounds like I'm not the only one who's started seeing e-cigarettes with a new sense of familiarity. In a time when smoking is more frowned upon than ever, Vapor Corp. is positioned perfectly to cash in on a market driven by the stigmatized but otherwise undiminished demand for nicotine. A word of caution, however: at $5.60, this $92 million company has a fairly thin share structure. With so few shares out and so much attention currently being given to this rising sector, even something like a Nasdaq listing won't be enough to decrease volatility. This stock is destined to go up, and suddenly... perhaps even revisiting its highs from the end of 2013 at some point later in 2014. And to those whose morals are making this investment decision difficult, just remember this: An investment with Vapor is an investment in a company that doesn't sell any traditional cancer- and emphysema-causing tobacco products. The same thing cannot be said for an investment in Altria or Lorillard. Get in on this one before it runs away. 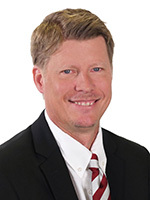 Brian is a founding member and President of Angel Publishing and investment director for the income and dividend newsletter The Wealth Advisory. He writes about general investment strategies for Wealth Daily and Energy & Capital. Known as the "original bull on America," Brian is also the author of the 2008 book, Profit from the Peak: The End of Oil and the Greatest Investment Event of the Century. In addition to writing about the economy, investments and politics, Brian is also a frequent guest on CNBC, Bloomberg, Fox and countless radio shows. For more on Brian, take a look at his editor's page. CVS (NYSE: CVS) will no longer sell cigarettes in its stores; here is what it means in the long-term for investors in retail, healthcare, and commerce. Within the legal framework for marijuana growing and vending, there is space for a craft home-growing trade. Here are a few promising companies that cater to that crowd. You've heard the old story of the shovel salesmen in the the California gold rush. The legalization of Marijuana is having a similar effect on ancillary industries that cater to pot consumers.